The old Archie-published Sonic the Hedgehog series was the first comic book I ever read. For years, I would only buy red running shoes. My first words were “Gotta go fast.” Alright, that last one’s not true. The point is that for kids like me, Sonic the Hedgehog was a massive cultural influence growing up. Something bigger than even two decades of awful, awful games could stamp out. As a result, the news that the original Archie series was coming to a close was cause for concern and — with its resurrection under IDW’s label — cause for hope. 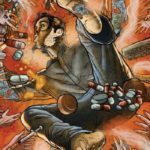 What changes would the comics industry’s foremost adaptor of beloved 80s and 90s pop culture bring to the series? Would we ever see our favourite characters like Sally Acorn, Rotor the Walrus or Bunny Rabbot again? (I know, the names are dumb, but you’re just going to have to take my word on their emotional significance.) And maybe most important, with the Sonic franchise’s long history of critically mishandled installments… would it be any good? 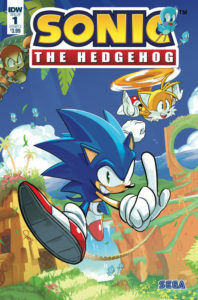 With the arrival of IDW’s Sonic the Hedgehog # 1, most of those questions remain unanswered. The only classic Sonic characters to show their faces are Sonic himself, Tails, Amy and Doctor Eggman. Although there are some characters who hint at an underground Freedom Fighter movement like the one in the Archie series, with the debut issue being conspicuously plot-light, there are precious few hints about how much of the Archie series will survive the transfer. There’s a definitive answer to the most important question, though: Is it any good? Well, so far it’s great. The panel sequencing and artwork in Sonic the Hedgehog # 1 perfectly convey the bouncy, fast-paced motion essential to a good speedster story. And let’s take a moment here to acknowledge the magnitude of that acheivement, too. This creative team has managed something even most Flash comics don’t: a real sense of speed in an entirely static medium. Pair that with vivid, colourful scenery and a soaring quality that recalls the best Sonic games’ platforming segments, and the result is pretty special. The story in Sonic the Hedgehog # 1 is exceedingly simple. A roving horde of Eggman’s robots fall upon a small town, so Sonic and Tails team up to beat them into scrap metal. 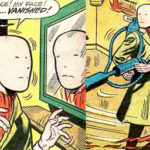 It’s classic, fun and leaves a lot of space to establish the visual and kinetic tone of the series. It may also be a sign that this series is targeting an even younger demographic than the older Sonic comics did. Honestly, that’s probably a good move, given… well, everything about Sonic. A bright, cartoony franchise is always going to draw a younger audience. So you might as well cater to them. As much as I loved the old school Sonic comics, their storylines involved some completely insane stuff for a kids’ comic. Plot details ranged from murder and betrayal to interstellar politics. For example, there was a whole arc that explained that Sonic’s home planet of Moebius used to be our very own Earth. That was before an alien species exterminated humanity using gene bombs which then mutated the animals into talking blue hedgehogs and whatnot. I guess what I’m saying is: Yeah. 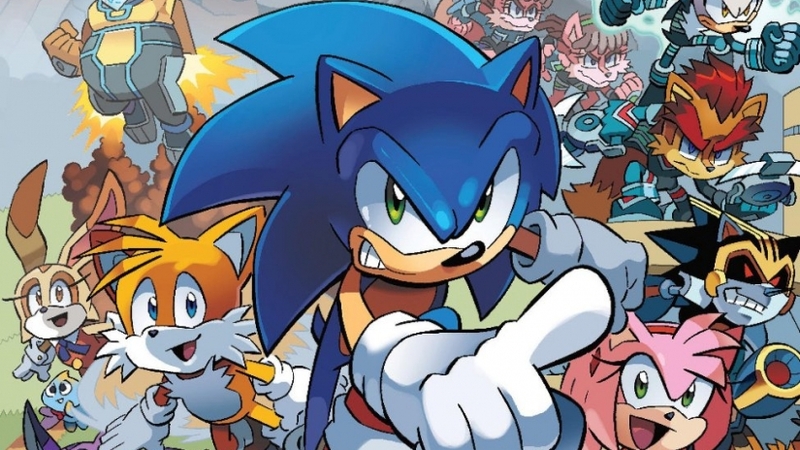 We could probably use a reboot, and Sonic the Hedgehog # 1 is worth your time.